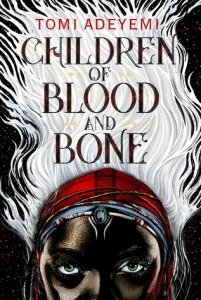 Happy book birthday Tomi Adeyemi and Children of Blood and Bone! I was unaware of the hype surrounding this debut. I'm glad I was since I usually have a knee-jerk reaction to hype. Believe it. Folks, this debut is impressive. The characters are brilliant and memorable. This world is immersive. I simply cannot wait to return to it. Zélie Adebola remembers the night the magic disappeared from Orïsha, a fictional kingdom in Nigeria. That night all the adult maji were rounded up by the king's forces and massacred. Her own mother was beaten and hung from a tree, leaving behind a bereft husband, Zélie and her brother, Tzain. Marked with the white hair of a diviner, but having no magic, Zélie trains with Mama Agba to learn the art of combat. She's brash and headstrong and prone to getting in trouble with the guards whose usurious ways keep Zélie's family and village on the brink of survival. She rashly decides to shelter a runaway noble and is stunned to discover that this trembling rich girl is none other that the king's daughter. Amani has fled the palace with a magic scroll and now she is hunted by her own father's army led by her brother, the prince and heir to the kingdom or Orïsha. Could this scroll be the key to awakening the magic? Zélie and her brother agree to protect Amani and the three set out to find an ancient temple to learn more about awakening the magic. They are doggedly pursues by Inan, who is hiding a terrible secret of his own. It is no surprise that the book has already been optioned for a movie. This superb debut is sweeping and cinematic, featuring brilliantly flawed and complicated characters, brutal violence, betrayal and nail-biting suspense. This is a first-purchase for all teen collections. Give it to your patrons with stamina and maturity who love high fantasy and brilliant writing. *I was thrilled to learn that the audiobook will release at the same time as the book and was narrated by the incredible Bahni Turpin. Can. Not. Wait. To. Reread. This. With. My. Ears!